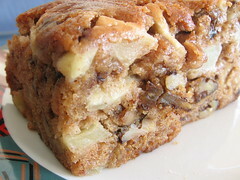 Spicy Apple Cake - Do You Know The Muffin Man? Notes: This cake is the result of my search for recipes to use up apples and half-and-half! I doubled the amount of apples to 3 cups (Granny Smith) and the cake turned out very moist, as expected. A nice snack.